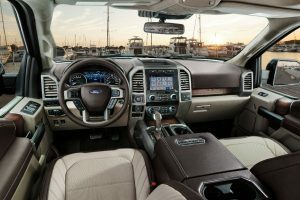 Ford is the latest to bring one back, joining Ram – which offers one in the Ram 1500 – and anticipating Chevy, which will also offer one later this year in the 2019 Silverado 1500. 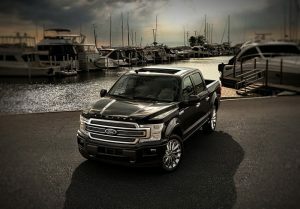 The F-150 is Ford’s full-size, 1500 series pick-up. 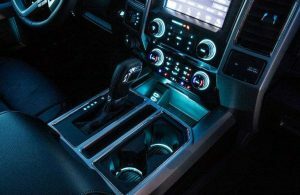 Like its main rivals – the Chevy Silverado and Ram 1500 – it’s available in an almost limitless array of cab/bed/trim configurations, from a fairly basic work truck to a $70k-plus Vegas Casino on wheels that gets to 60 in less than 5 seconds. This engine bridges the gap between smaller gas-burning engines which are reasonably fuel-efficient but can’t pull or haul much – and powerful (but thirsty) V8s. The Joker in the deck – Heath Ledger-style – is the F-truck’s newly available 450 horsepower twin-turbo V6 – which was previously only available in the limited-production/high-performance SVT Raptor version of the F-150. Now it’s available in the posh and doesn’t-look-like-a-killer Limited trim. 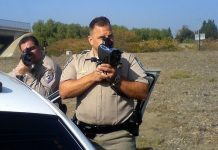 Equipped with this turbocharged berserker, the F-150 – a full size truck, remember – can launch itself to 60 MPH almost as quickly as a Mustang GT. Prices start at $28,155 for the base XL trim regular cab with 3.3 lite V6, six-speed automatic, 6.5 foot bed and 2WD. A top-of-the-line Limited Super Crew with 4WD and the Raptor’s 450 horsepower twin-turbo V6 stickers for $70,560. If you buy either the diesel or the Raptor V6, you’ll get a 36 gallon fuel tank in place of the otherwise standard 23-26 gallon tank. 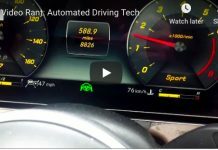 This is an upgraded version of Ford’s Sync interface; it allows remote access to the vehicle via smartphone. 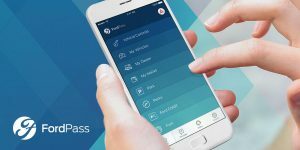 You can use FordPass Connect to remotely unlock – or lock – your truck, check maintenance reminders and even schedule the engine to start automatically at whatever day/time you select. A truck that pulls – and hauls. 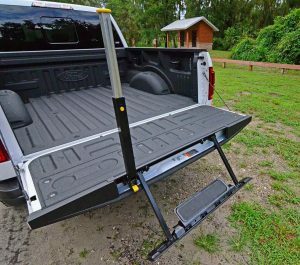 Ladder – and pole – built into tailgate, to help you get up and into bed. Rivals make power the simpler way – with bigger engines. No need for complexity-adding turbos and peripherals that might need expensive repairs at some point down the road. Bed is so high up that you need a ladder – and a grab pole – to get up there. 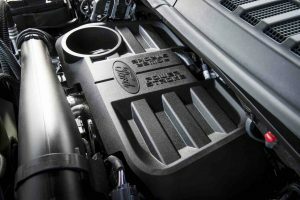 The ’19 F-150’s least powerful engine is a 3.3 liter, 290 horsepower V6 – an engine that’s more powerful than the biggest/strongest V8s the F-150 was available with as recently as the early ’90s. 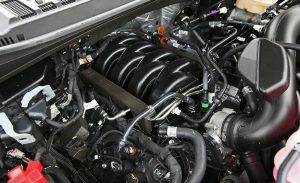 It is also nearly twice as powerful as the 149 horsepower 4.9 liter in-line six that came standard in the 1990s-era F-150. Next up is a smaller – but much stronger – 2.7 liter V6. It makes a very sturdy 325 horsepower and 400 ft.-lbs. of torque, astounding power from such a little engine. The secret is the little engine isn’t, really. A pair of turbochargers pump it up to the functional equivalent, when on boost, of a V8 in the mid-five-liters range. Because when the turbos aren’t pumping up the displacement of the 2.7 liter engine, it’s a little engine and so consumes less gas than a larger full-time displacement engine: 20 city, 26 highway for the 2WD model, which is actually better than the base 3.3 V6 (19 city, 25 highway) and remarkable given the power uptick. If you’re a traditionalist and like full-time displacement, there’s still a 5.0 liter V8 on the roster. It makes 395 horsepower and the same 400 ft.-lbs. of torque as the 2.7 liter engine, without the turbos. Mileage is 17 city, 23 highway – a bit less than the 2.7 liter engine, but better than the ’90 F-150’s base straight six, which made less than half as much power. Normally – well, historically – the big V8 would be at the top of the lineup. But it’s actually more like the back-up quarterback. The F-150’s strongest engine is a smaller engine. 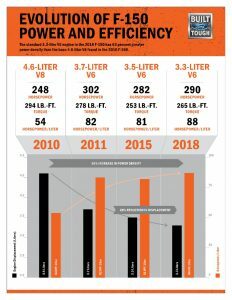 Just 3.5 liters – which is also smaller than the top-of-the-line V8s in rivals like the Chevy Silverado, which offers a yuge 6.2 liter V8 as its heavyweight engine; and the Ram 1500 – which packs a 5.7 liter V8. But the 3.5 V6’s output isn’t small. There are two versions. The first makes 375 horsepower and 475 ft.-lbs. of torque. The ultimate version – previously available only in the Raptor – makes 450 hp and 510 ft.-lbs. of torque. 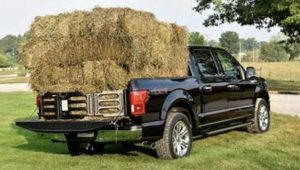 Equipped with the latter version, the F-150 is the quickest way to haul a stack of 4×8 sheets around. Zero to 60 in 5 seconds or less (if the bed is empty). Official mileage numbers weren’t available when this review was written in early February, but should be in the same ballpark as the 375 hp version of the 3.5 V6, which rates 18 city, 25 highway in 2WD form. This, for the record, is also better mileage than the 1990 F-150’s 149 hp straight six managed – and that version of the F-truck did not get to 60 in 5 seconds. It also could not pull 13,200 lbs. 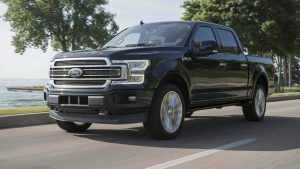 – which the current F-150 can. That’s best in class, too. There’s one more engine to consider, too. 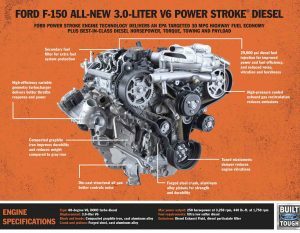 It’s the new 3.0 liter PowerStroke diesel V6, which produces 440 ft.-lbs. of torque (more than the 5.0 V8) and 250 hp. It can pull 11,400 lbs. – also best in class and more than some rivals’ V8s – while using significantly less fuel. 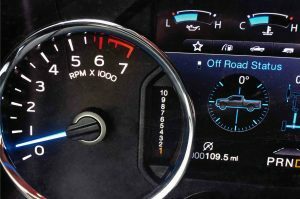 Ford touts 30 MPG highway capability for the 2WD model – also best-in-class. This engine also comes bundled with a 36 gallon fuel tank – giving it extremely long legs on the highway. Theoretically, it ought to be able go almost 1,000 highway miles before it needs to pit. That’ll take you most of the way from El Paso to Nacogdoches . . . if your bladder can take it. Another measure of how far we’ve come is how nice big trucks have become – and how easy they are to drive. The 1990 F-truck was a truck – in the good and bad sense. 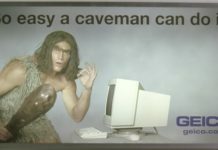 Good, in that it was rugged and simple and you could beat the hell out of it and the thing would usually pick itself off the mat, Rocky-style – and come back for more. Trucks used to have the finesse of a drunken buffalo tromping through your living room. You felt – and heard – everything. A long drive in a truck was something that required physical endurance and good circulation as well as a loud aftermarket stereo to drown out the drone of the drivetrain, tires and road. How it used to be . . . The F-150 can do more work than its ancestors but it isn’t work to live with it. It is so nice a place to be in that you don’t need a car for when you’re not working. A new Mustang GT is only negligibly quicker (count out 1 second; that’s the difference) despite being a third the size and weighing at least 1,000 lbs. less and the Mustang, though all kinds of fun to drive, does not set five comfortably, cannot pull 13,200 lbs. and is as useless in the snow as empty pistol at a gun fight. The 510 ft.-lbs. of torque must be experienced to be appreciated. The accelerator pedal is a magic pedal. Depress it even a little bit and this massive ingot of aluminum folds space and – just like that – you’re someplace else. The startled looks on the faces of the drivers of sports cars as you not only keep pace but outpace them is hard to put a price tag on. This is a case of have two cakes, eating them – and not getting fat. 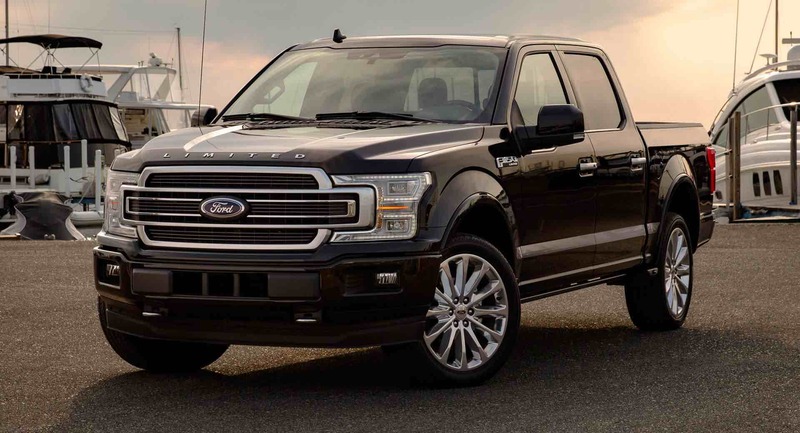 Compared with a ’90s-era F-150, the current F-150 (like all current 1500s) is a super-sized galoot. To appreciate this, park one next to a ’90s-era truck and marvel at the massiveness – and tallness – of the new model. As easy as the F-150 is to drive, it can be harder to park. Or rather, it’s tougher to find parking spots which will accommodate its behemothian dimensions. Ford tries to help with various park assist (and trailer back-up) technologies, but size ultimately does matter. It’s the F-150’s only real liability. The world isn’t sized for it. 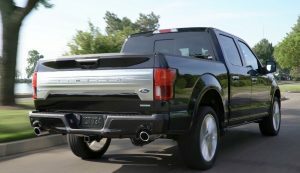 Dealing with tight-radius drive-thrus, cul-de-sacs and secondary roads narrowed by parked cars on either curbside can make piloting an F-150 tricky at times. But once straightened out, out on the open road, there’s very little that can touch it, whether the measure is how quick it is or how nice it is – or how capable it is. The F-truck has the same general shape as other 1500s – with Ford-specific styling cues – but the thing that makes it not only different but unique is what it’s made of. Every other 1500 series truck is a steel-bodied truck. 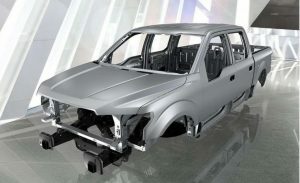 The Ford’s body is made entirely of aluminum. This shaves several hundred pounds of weight off the bottom line, which is part of the reason for the F-truck’s quickness – as well as as its capabilities. The less of itself the drivetrain has to haul around, the more cargo it can cart in its bed – and the heavier the trailer it can tow. The downside is what happens if you hit something – or something hits you (like a deer). Aluminum is more easily bent than steel – and harder to fix once it is. The F-truck’s repair costs are thus higher – at least potentially – and this will probably reflect in insurance costs, eventually. Also, while aluminum doesn’t rust, it does corrode. Nothing lasts forever but the Earth and sky – and not even them. 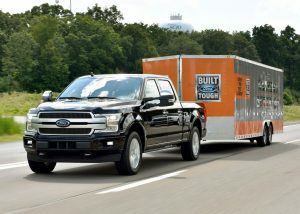 You can still get the F-150 in the traditional work truck configuration – regular cab, with an eight-foot bed. 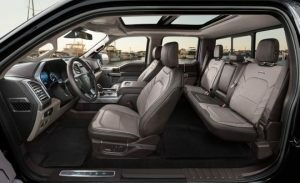 But you can also mix and match cabs and beds to suit – all the way up to a 163.7 inch wheelbase SuperCrew with 43.6 inches of backseat legroom and an eight-foot-long bed behind them. This one’s 250.5 inches, bumper to bumper, just shy of 21 feet. Then adjust bed length to suit – long (eight foot), mid (6.5 foot) or short (5.6 foot). 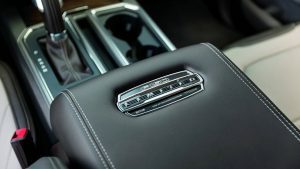 You can arrange these almost however you like, regardless of trim (base XL, XLT, Lariat, King Ranch, Platinum and Limited). Chevy and Ram also offer the same degree of mix and match – but not the aluminum body, for good or ill. The Japanese 1500 series trucks – the Toyota Tundra and Nissan Titan – offer a limited range of cab/bed configurations, and fewer drivetrain choices. They’re also steel-bodied – for good or ill, depending on your point of view. All trims – even the base XL – come with AC, trailer sway control, trailer pre-wiring and a 4.2 inch LCD display screen in the center stack. Power windows, however, are not included with the base XL trim. The XL’s manual roll ’em up windows are among the few “rough it’ aspects you’ll encounter – and it’s more about the people who use their trucks for serious work not wanting to have to worry about a power window not rolling up (or down) on a 105 degree Texas day. 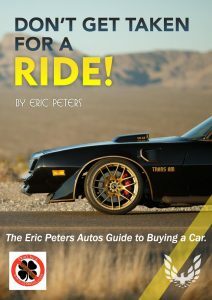 Eric, just FYI: this write-up lead to my son buying one, with my opinion to him. He’s finally growing up a bit and realized his boy-toy focus RS is just that, a boy-toy, so he finally realized he needed a pick-up, and his assumption of using mine was a bad assumption. I was going to charge him .50c/mi. to use it. Call me crazy, haha.. He made a good deal with a decent local ford dealer for a certified ’18 XLT with 10Kmi on it, and he chose the N-A 5.0L V8, which I thought was a smart choice. Update 2: I drove his 5.0 Ford. Let me start with I have been in GM trucks since the 80’s, easily 10+ trucks. I always loaded them up and bought the largest engine avail. at the time (5.7, 6.0, 8.1, 6.2’s). I literally lived in the things so I needed them to be nicer. And my local dealer really took care of me, obviously since I was trading every 2-3 years. I always had complaints, this or that, but they always got better every cycle, so I persevered. 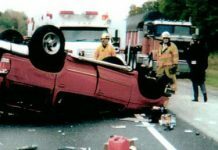 Then GM made a drastic change around ’07, and they started to not be as drivable as before. Horrible short shifting, no down shifting, etc…. I believe that they did all this for mpg-tuning. So I’ve been a GM kool-aid-drinker most of my life. 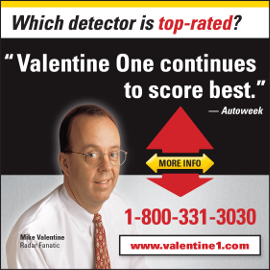 I drove the others a lot as well, and still, prior to ’07 I strongly believed GM’s to be the best. Not anymore. So I drove my sons 5.0 not expecting much. Wow have I been wrong, I’m guessing for a while. I liked it so much, my warranty was up on my 6.2 Sierra and they wanted $2600 to extend it. So what the hell, I found a ’18 CPO F150 with the 5.0 and put a some cash down and got it. Driving it home over the weekend I was pleasantly surprised how nice it was, engine tuning was spot on. I’m guessing the 10sp in the 18+’s made a big difference, although I hadn’t driven the older version. And I don’t need the top trims anymore cause I don’t daily drive a truck anymore, so the lower trim CPO was good for me and my GM was still worth a lot (top trim low miles). Now to be fair to GM, the 6.2 with the pedal to the floor will run away from most if not all, but who drives like that? And yes, if towing heavy a lot, the GM 6.2 would be a better choice, but I only tow light now and not a lot. Thanks Eric for the write up, it made a difference. How many of these “forced aspiration” engines will be around after 150,000 miles? I’ll bet, very few. I hope that I am wrong, but a naturally aspirated V8 with plenty of torque will last a lot longer. 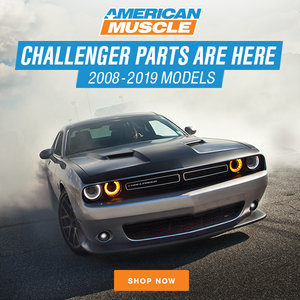 All of my naturally aspirated vehicles have well over 250,000 miles and are still going strong, having never been disassembled for any major engine repairs. The new engines may deliver more power and torque for a given displacement, but how long will they last? I agree, but I don’t think it will be the hard parts that don’t last. I think it will be all the electro-mechanical devices. 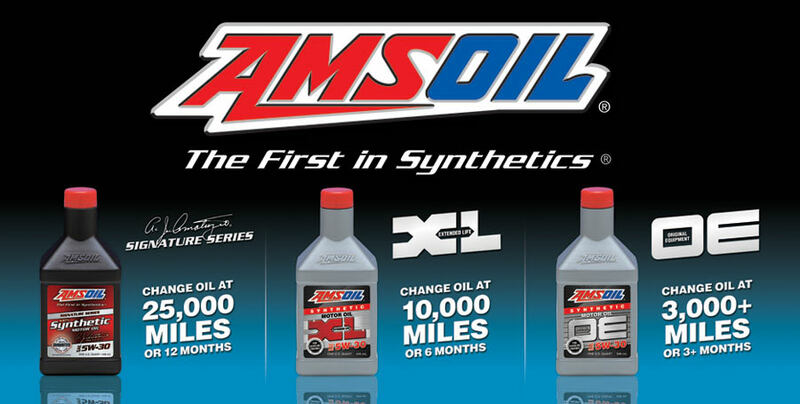 They are on camshafts, pushrods, etc…. Deal breaker for me as I am one of those hold outs still listening to CDs from start to finish in my commute. Did your teeth hurt writing this? This is so ridiculous to fathom that the late 2000’s trucks were only hovering around 300-325 HP in the V8 line up. Even after being tuned or adding long tube headers the older trucks are still somewhere short of 370 HP. Obviously in the 2.7 and 3.5 combo engines Joe-Blow has a snow ball in hells chance of fixing anything in that cramped engine bay or much less understanding what the hell is going on. If the year were 1999 I’d be sitting in a crew cab black F-150 with the old body style from that year. They almost look like the silverados of late 2000’s. From 2002 onward or whenever they changed, they literally look like boxes on wheels to me. A vehicle needs some curve to it, some design. Speaking of design, it is hard to pick out the new Rams from the old 2018 and older except for the badge placement. Same for these new F150’s, hardly any design change. GM on the other hand created some kind of Chevy Tundr-ierra Abortion looking thing that they are easy to spot and wince at on the freeway. NO THANKS! My 30 year old neighbor just bought a new Super Crew F250 Powerstoke 4wd. It came off the showroom floor lifted with aftermarket steps along the sides and the worthless short bed. 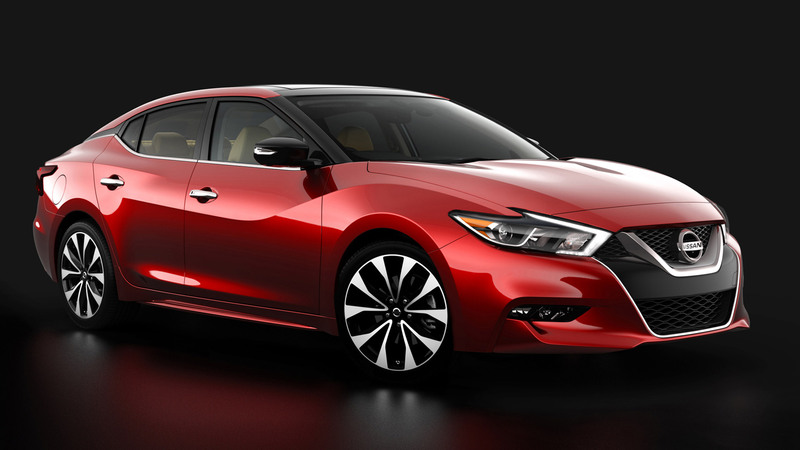 It’s bright metallic red paint is flawless from what I saw. 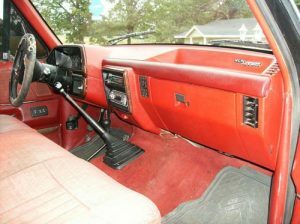 Nice interior with an inverter on the dash a about 8 switches/breakers for adding circuits. I wouldn’t buy it as is, don’t like the lifted thing. It’s the best riding Ford I’ve been in in decades, just don’t care for the lift. He’ll never use it for a pickup though. He has a 3/4 ton 4wd 89 Suburban he turned into a hunting buggy and a 3/4 ton 4wd ext cab Dodge Cummins that’s also lifted he uses as a work truck. I asked if I could borrow it to pull a car hauler trailer for an 800 mile round trip. It was a priceless moment. I don’t think finding me with his wife bent over the endgate of the Dodge would have shown as much shock. He was speechless. I let him consider it for a while and kicked myself for not video recording it. I just grinned when no reply was forthcoming. It was almost as funny as when an uncle who had never even been in a big rig asked if he could drive my new GMC 9500 semi when I was 23. There were 4 or 5 other uncles along with my dad in the room. They were all busting a gut at my reaction. I’m sure my face was red as a beet. Somebody handed me a drink and slapped me on the back while they were still laughing. 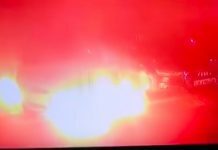 Those old cummins engines are solid. I’d rather have one of those than anything Ford makes nowadays. That’s only 800 miles. 1,000 mile range will get you from Austin to Atlanta, with maybe a couple gallons still left in the tank. Thanks for the review Eric. I’m in the market soon for a pickup and I had settled on the new Ram, but this raptor engined limited will at least get me to look/drive the ford. not sure an estimated 10G more for it over the ram is worth it though. But the Lariat you can get the longer bed and the 3.5T engine. Isn’t that the same Raptor engine? or is the Raptor engine the same size just boosted more? Yes, absolutely! That and a standard bed that isn’t lifted so I can actually use the damn thing for work. Ford should bling up a long SuperCrew and sell it as the Lincoln Pangaea. Longer even than a 79 Continental. Nice to read about a vehicle that offers so much more to celebrate than to grudgingly tolerate. Too bad it’s so freakin’ huge. I understand that a full bore work truck can make use of all that size. 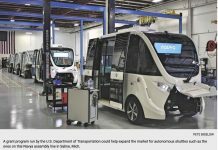 But the luxury and performance features these behemoths offer cannot be put to realistic use as a daily driver…..unless you live way beyond the outer suburbs. Perhaps we need yet another size range of trucks, between these big 1500s and the mid-sized Tacomas and Colorados, which are a very practical size, but short on pizazz. Something about the size of those mid- 1990s Ford trucks, with high performance engine options and upmarket interiors. I hate it when I come out from a store to find one (sometimes two) of these enormous things parked right next to me. 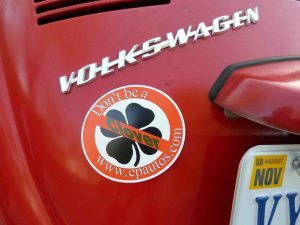 Make just pulling out of a parking space a risky proposition. It’s amazing how relatively “small” the old 1970s-1980s base-model, base-cab pickups were compared to the Leviathan trucks of today. But many of those older trucks had bigger beds and bigger engines. Even the shortbox was 6 or 6 1/2 feet. Many of today’s monster trucks have four doors and a leather rear passenger seat… but a 5-foot bed.